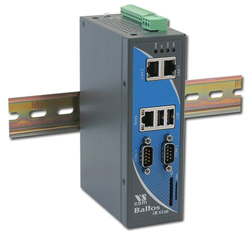 The OnRISC Baltos iR 3220 is a fanless and DIN-Rail mounting suitable industrial embedded PC with compact dimensions. It is based on an ARM Cortex-A8 with NEON SIMD Coprocessor, with up to 1GHz CPU clock speed. Low power consumption (3W typical), an extended temperature range (−20°C to 65°C), a wide power supply (12 — 50V DC) and an impressive MTBF (10.5 Years at 45°C) are qualities that make it an ideal system for industrial automation. Baltos iR 3220 can be booted from either NAND flash or SD card. The NAND flash is a robust boot medium capable of withstanding power cuts and vibrations. SD cards have the advantage of providing arbitrarily large storage amounts. Buildroot, Yocto and OpenWrt BSPs provide a small footprint and would fit well into the NAND storage, whereas Debian is best used on the SD card. The system allows extension with broadband GSM/3G/4G-Modems for installation on mobile internet bases. 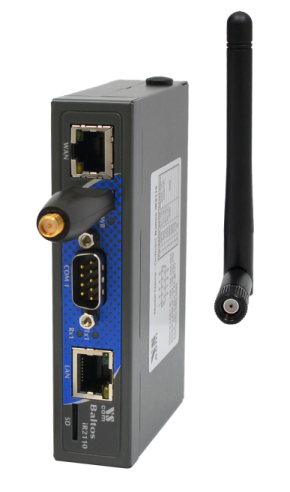 WLAN802.11b/g/n is available as a common option; furthermore, three locations for SMA-antenna sockets are provided. The great variety of interfaces such as LAN, USB, RS232/422/485 serial ports, I²C and Digital I/O enable Baltos iR 3220 to act like a powerful gateway between networks, various industrial devices and field buses. The Baltos series is fully ESD and surge protected, complying with IEC 61000-4-2 (8KV air and 4KV contact).